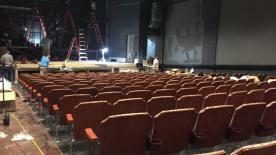 The Little Theatre's main Theater 1 will soon be showing movies again, as phase one of its renovation project wraps up. The theater expects to be showing movies there in the next week. Chris Brandt is the project architect with Bero Architecture. The Little Theater will soon be showing movies again in its main Theater 1 auditorium. WXXI's Caitlin Whyte has more. "Everything inside the auditorium itself, floor to ceiling ... no surface was untouched. 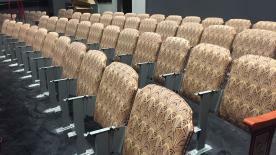 All finishes have been replaced; all the seating has been replaced." He says these renovations are a generational investment. "Generally, it’s remained this sort of cultural hub, this sort of stable rock within our community for decades." Work began in May 2018, and included new seating, cup holders, new lighting and more. Additional renovations to the building are planned for 2019. Phase 2 includes more ADA-compliant features, improved ticket queueing, better concessions, repurposing the inner lobby as a lounge and two new greenrooms. An additional $1 million needs to be raised to complete Phase 2 of the project. A grant made by the William and Sheila Konar Foundation for $250,000 was announced Saturday, bringing the fundraising total to $645,650 of the needed $1 million. The building originally opened in October 1929. The Little Theatre is operated by WXXI.